Cooking fish and other seafood at home is much easier than you think! 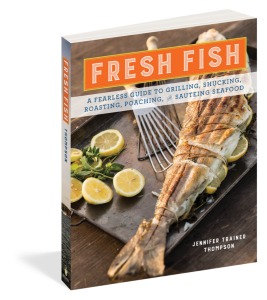 Fresh Fish offers simple step-by-step instructions for all of the essential cooking methods, including baking, pan-frying, braising, broiling, steaming, poaching, roasting, marinating, and grilling—along with 175 mouthwatering recipes that bring out the best in everything from fish fillets and whole fish to shrimp, mussels, lobster, clams, calamari, and more. You’ll also learn how to buy fish (even whole fish) with confidence, how to serve fish raw, how to clean freshly dug clams, and much more. Beautiful photography celebrates both the food and the lazy charm of summers at the beach; this is a delightful read as well as the cookbook you need to easily enjoy your favorite seafood at home.